Welcome to the Gardens of Babylon! 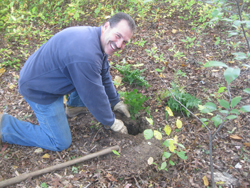 For the past 10 years, Danny Raccomandato and his crew have been taking on the task of renovating the landscapes at each of our Town facilities. 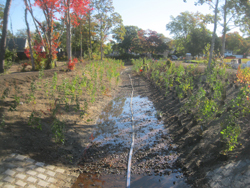 Projects consist of tree and shrub plantings, lighting and water features, and walkable pathways. There is a unique botanical and environmental tone to each of our initiatives, and we look forward to sharing our progress with you! With some exciting new projects on the horizon, be sure to check into this page for the latest updates on Town of Babylon horticulture as well as gardening tips and advice. Thank you for visiting our page! If you have been near the front of Town Hall lately, you will have noticed that the Kwanzan cherry trees have been removed. It is always sad to remove a tree, but time and disease had taken its toll and it was time to undergo a renovation. 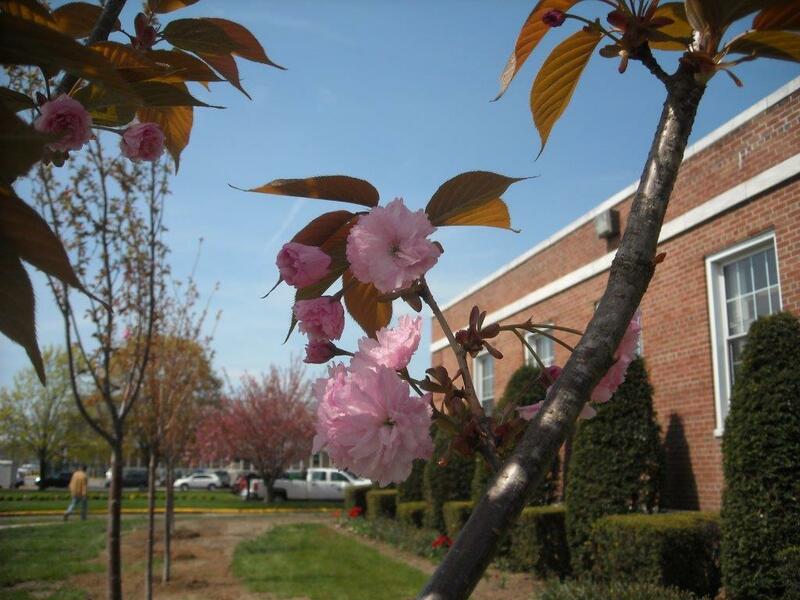 The new Kwanzan Cherries were planted this past Monday, just in time for Arbor Day, which is the last Friday of April each year. If you have a place in your yard, plant a tree this Friday in honor of Arbor Day; I know Mother Nature will thank you for it! We were lucky to witness some wonderful happenings while working at Geiger Park last week! Since we started the redevelopment, there has been quite an increase in the presence of wildlife residing there. Last year's construction of the stormwater wetland was not only intended to help filter the water flowing from the neighboring community, but to also create a stable habitat for our native wildlife that call Geiger home. We relocated some of the fish from the lake to the stormwater wetland, and the population of fish in this area has now doubled. Additionally, there are about 30 turtles swimming in the lake and sunbathing on the rocks and the shore; these consist of painted turtles, red-eared sliders, and snapping turtles. But the highlight of the day was our discovery of a Killdeer nest. We found the nest on the ground in the morning, and by that afternoon the eggs had hatched. The garden has become a haven for so many creatures, and as we left--to truly cap off the day--a beautiful red-tailed hawk flew overhead! Earth Day is this Friday, April 22nd, so be sure to give back to our planet--the wildlife in your area will thank you! The revitalization of the Geiger Park and Pool in Deer Park is the latest horticulture project underway here in the Town. Jenny Ulsheimer, a horticulturist from the area, was hired to assist in the development of this 27-acre site, which will consist of a new botanical garden. The Geiger Spray Park is a 10,000 square-foot water park that currently sits on the site, and in addition to the various water cannons and slides, the park contains seasonal and permanent plantings that give it a true botanical feel. 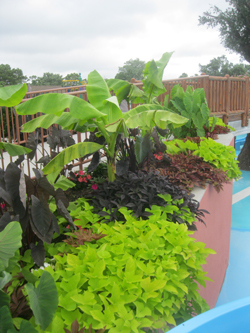 The plantings consist of tropical, ornamental, and native plant species. 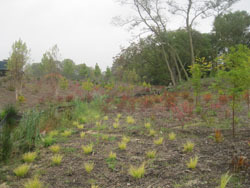 These gardens emulate what can be expected in the new botanical garden. The Carlls River runs through the property and is one of the many watersheds on the Island that empty into the Great South Bay. Due to years of invasive species occupying the surrounding natural wetlands, an extensive renovation was completed to restore and recreate the plant life that once lived along the water's edge. The wetland is considered to be a "red maple lowland," filled with red maple (Acer rubrum), high and low blueberry bush (Vaccinium), sweet pepper bush (Clethra alnifolia), and red stem dogwood (Cornus sericea). This group of plants was also utilized in the creation of a stormwater wetland that was built to filter the water that comes into the facility from local storm drains. The reestablishment and creation of these wetlands have increased the amount of wildlife on the site and is helping to clean the water prior to its exit to the Bay. In 2015, we were able to obtain funding to start the development of the west side of the garden along Elk Street. A rose garden arbor and pathway were constructed, lighting and irrigation were installed, and a garden cottage was built. In 2016, we will begin to plant some of the structural trees and shrubs, creating a framework for the development of the botanical garden. Be sure to check in for updates on this initiative. We look forward to sharing our progress with you!